Fix the housing crisis: take the power local and let’s get dense! The Porirua Growth Strategy has lots of great detail about how they want to do greenfields development. (Good news Kate Spencer, Plimmerton Farm actually looks pretty good!) But there’s next to no detail on intensification, just some areas done on the map apparently with MS Paint. 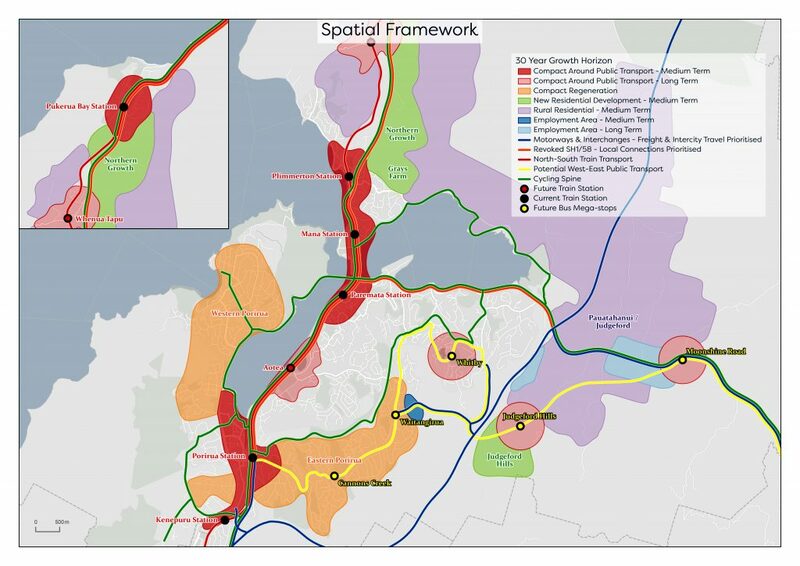 Porirua Growth Strategy’s Spatial Framework, featuring red blobs (indicative intensification). That’s about it for the densification. I can understand why they might be nervous: they’re scared of the NIMBYs. They’re strong and they’re out there – they’re not just the Aotea people with a hair-trigger for anything a little bit progressive. No, they’re everywhere. Hey, everyone’s scared of the NIMBYs (except YIMBYs). Fair enough. Infill or densification discussions get pretty ugly (see well-heeled Aucklanders spitting venom in Unitary Plan meetings at the prospect of their neighbours having the option of densifying). And greenfields development is way easier: firstly there’s hardly any “backyards” to be in, plus everyone loves a blank canvas. But here are the options if we want to be all about the greenfields. And, lucky us, we can easily have all four of these together. So let’s get serious about densifying our already-developed areas. They call it “brownfields” (which my 8-y-o said is a yuk name that sounds like dirty places, I’d agree) but it’s actually the best thing for our towns since the invention of the car. But when everyone goes “Yes sure intensify, but I don’t want three storeys next to me thankyou very much, I don’t want [people looking in my windows / shading / more traffic / my outlook reduced” it’s really hard. 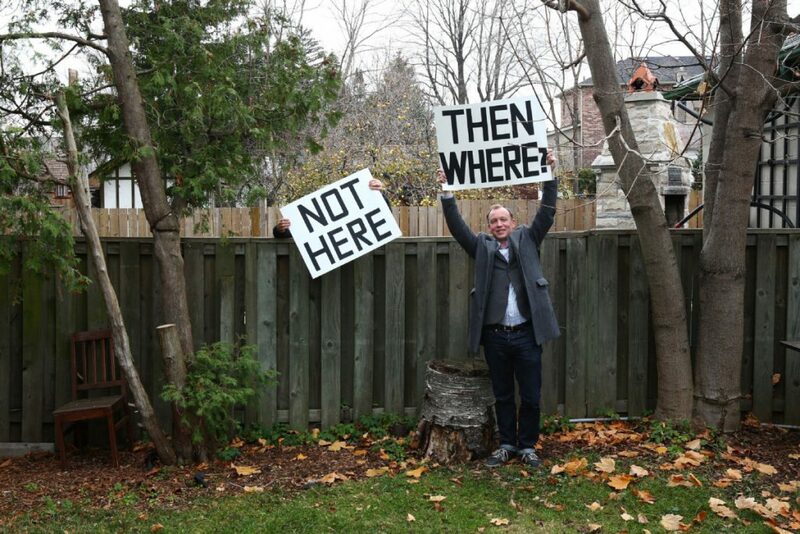 Are we all trapped in anti-densification NIMBYism? Thing is, while we’d like to think we’re better than the “Miserables of Kohimarama” or the hair-trigger Aoteans, we’re probably pretty NIMBY too when push comes to shove. A friend put me onto the YIMBY movement. Strong in big cities (I read about London, San Francisco, New York), it’s people who want greater density of living in their neighbourhoods. They’re getting their voices heard plus helping to improve the rules – including the laws of behavioural economics – that make densification too hard. Look at London YIMBY’s Better Streets proposal. They believe that streets can be made more beautiful with densification – not just Density Done Well, but basic stuff like you get better play spaces for kids right by their homes. There’s so much NZ should copy! Not that different and we deserve better streets too. Here, landuse and transport economist Brendon Harré has done lots of research into densification and how to make it easier and better in New Zealand. Hyperlocalism is Controlling land-use at a more local level than local government, or shifting land-use powers to a more local level. (London YIMBY definition). Decentralising. Taking power back to community. Localising. Whatever you want to call it it’s about tapping into the organising power of “the smallest units of public cooperation” (in other words, real people coordinating at ground level with neighbours) to control land-use. And we can actually do it! And Do we need to think small to solve big problems like the housing crisis has great practical ideas. Is this the silver bullet? Of course not, there isn’t one. This proposed remedy would work best as part of a wider urban growth agenda that addresses issues like urban and spatial planning, infrastructure funding, congestion pricing and legislative reform. The New Zealand government has released a Cabinet Paper with a proposed urban growth agenda. New Zealand’s main opposition party -the National Party has said that its RMA Reform Spokeswoman Judith Collins is working on an RMA bill to reform planning rules for the country. This policy work will be publicly released in 2019 as proposed legislation which the National Party will take to the 2020 general election. We need more density in Wellington. Remember those four crappy options at the top? Worse traffic? More socially isolated communities and kids and old people? Worse water? No thankyou. No no no. We can put all Porirua’s growth, or at least the first big tranche of it, into brownfields instead. Harre found “higher density liveable neighbourhoods that I have examined in Hobsonville have five times the amount of housing compared to older suburban neighbourhoods.” 5x! Hopefully Housing NZ / Hobsonville Land Company will do great brownfields redevelopment on their land. But it’s got to be more than that and it mustn’t just be big government. Let the market blossom with smaller units of organised neighbours, real people, so we too can love living in well done medium-density in our home town. Seems to me that these proposals just continue the sprawl of suburbia all over the land around Porirua. I find that prospect rather abhorrent. As a prime example of that Suburban Sprawl, the recent – and ongoing – Aotea block development shows just how awful it can be. Yes, it is successful, and people are buying the properties, but that does not mean it is any good. To be honest, I’d say it is fairly bloody awful. There is nothing of what could be termed Architecture, just endless wiggling cup-de-sacs, mindlessly carving up the land into strips of asphalt, with grey mock-tiled roofs over bland beige boxes. Are these people driving to Porirua train station and then leaving their car there for the day, or, once in their car, do they just drive on into Wellington? They’re certainly not working in offices in Porirua – there are hardly any offices in that city – so instead they are just causing havoc on the motorway through Tawa. Is there any thought or planning on what would happen in Wellington if these “northern growth” suburbs actually get developed? Is this considered on a holistic viewpoint with the whole of Greater Wellington, or is the prospect just to develop land and sell sections and that is as far as it goes?